This 11th century temple in Bangli village, one of the largest on the island, was built by Cri Brahma Kenuti Ketu. Thirty eight steps take you up to the gates of the temple, sculptures from the Hindu epic Mahabharata on either side. Like every temple in Bali this one has three Courtyards, and there is a venerable 700 year old Banyan tree in the second courtyard. The top courtyard has a meru tower of eleven tiers, with smaller merus to the sides. For some reason some of the plates on the walls here depict rural England. There is a stone lotus throne here that depicts the Trinity - Brahma, Shiva, and Vishnu. The Ngusabha ceremony is held at the temple every three years. Right in front of the Kehen temple through, there is the Penyimpenan Temple, famous for three inscriptions that seem to acknowledge the existence of the Kehen. The first is from the 9th century, the second from the 10th century, the third is from the 12th. A sarong and a sash will be provided for you to men when you pay the entrance fee. How popular is Kehen Temple? 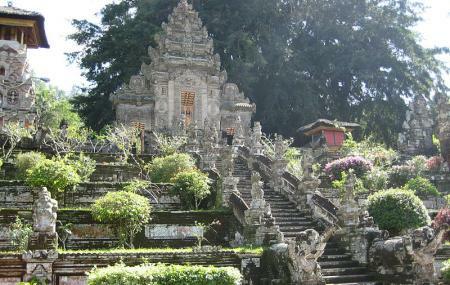 People normally club together Gunung Kawi Temple and Setia Darma House Of Mask And Puppets while planning their visit to Kehen Temple. People also prefer to start their day with Kehen Temple. Tempat yang menarik untuk dikunjungi. Melihat banyak hal yang unik bisa untuk mencari inspirasi baru dan pengetahuan yang lebih luas. Eine interessante und saubere Tempelanlage. Hier ist kein Sarong erforderlich. Im Januar sind wenig Besucher da.